At its peak in the late 1960s and early ’70s Dad’s Army was one of the most popular programmes on TV and its stars were some of the best recognised performers. It is no great surprise that they frequently appeared, in character and in costume, in a number of off-shoots that had nothing directly to do with the series itself. In their time they did everything from judging Blue Peter competitions to TV adverts. In 1969 the BBC was planning a tribute to Noel Coward, assembling a diverse cast of actors and singers to take part in a revue celebrating the great writer, actor, raconteur and wit. As it happened, in 1941, Coward had written a song – Could you please oblige us with a Bren gun – satirising the Home Guard and their struggles to find armaments. With a number of experienced musical theatre performers in the cast it was a short step to bringing together Coward’s song and the cast of Dad’s Army for a one-off performance. The song is typical coward, with a satirical lyric set to a tune that borrows heavily from The Stately Homes of England. Performed by Arthur Lowe, Clive Dunn and (despite his, err, unique singing voice) John le Mesurier, the Dad’s Army section of The Coward Revue is a very enjoyable diversion from the TV episodes and something that many people haven’t encountered – you can find it with the Christmas specials on the DVD box set. Or here. Bet you find yourself humming along by the end! 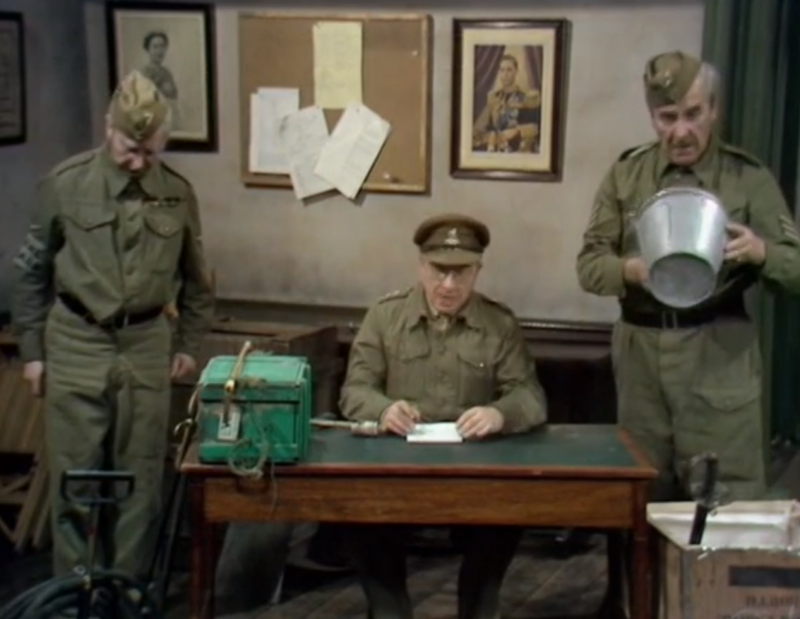 50 Moments that made Dad’s Army is a series of blog posts each focusing on one moment that helped define the popular comedy series. There will be one post for each of the 50 days leading-up to the 50th anniversary of the first broadcast of the first episode of the series on 31st July 1968. 50 Moments that Made Dad’s Army is brought to you by walmington-on-line.co.uk and copyright of all video clips belongs to the BBC. This entry was posted in blog on July 26, 2018 by wolAdmin. We will never sell your address to others, promise!